On the first day of Christmas, my true love gave to me… A partridge in a pear tree. 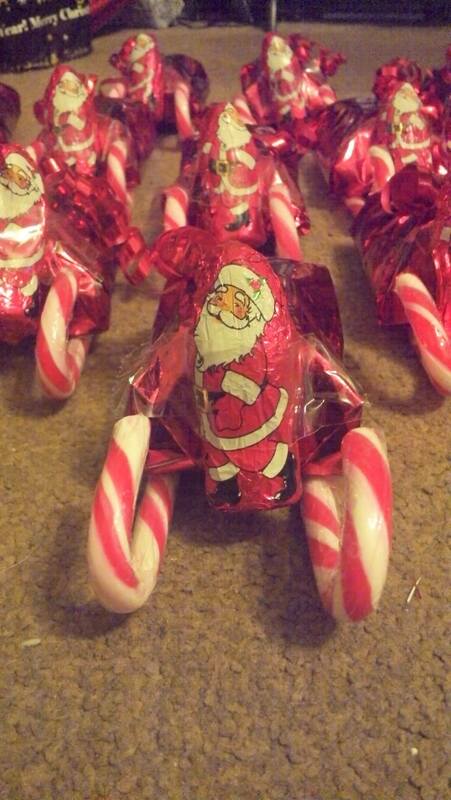 I had wrapped a 4-fingered KitKat, a ‘Freddo’ chocolate bar, and a Turkish Delight up in red paper… Then I taped the candy canes to the bottle (with extreme difficulties, I might add), then the Father Christmas was added last. To say that I had to rearrange the way that the candy canes and Santas’ were sitting more than once is an understatement. So this year, I had decided that I was going to put together the dry ingredients for Christmas Elf Soup. That way, all the kids had to do was to ask a grown-up for help in pouring the hot water over the mixture. Three re-sealable food bags. Small. One slightly larger food bag; to store the latter in once full. Hole punch and Christmas ribbon OR a stapler with staples. Add four heaped teaspoons in to a dry, re-sealable bag. Add two heaped teaspoons of the dark chocolate drops to another dry, re-sealable bag. Add a small handful of mini-marshmallows to a third dry, re-sealable bag. Position the filled bags neatly in to the slightly larger food bag. Add the (still wrapped) candy cane in to the bag. 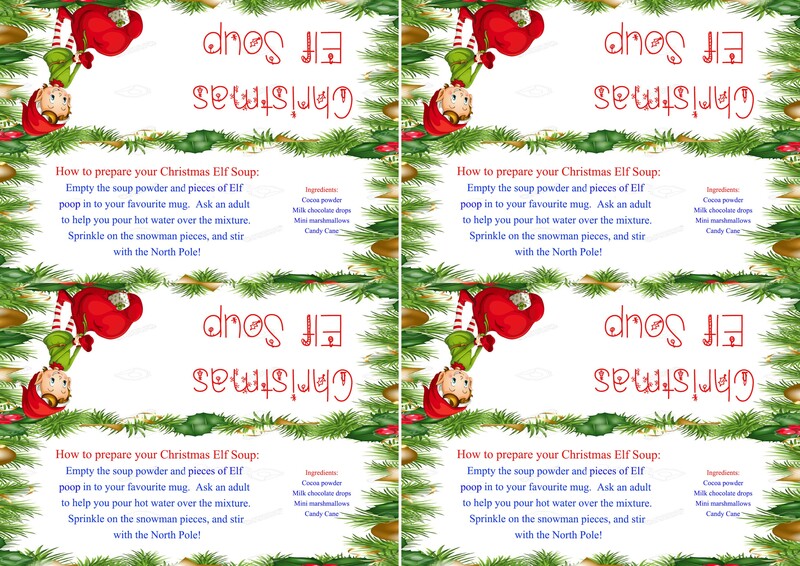 Seal shut with the label, using staples, or hole punch with ribbon. 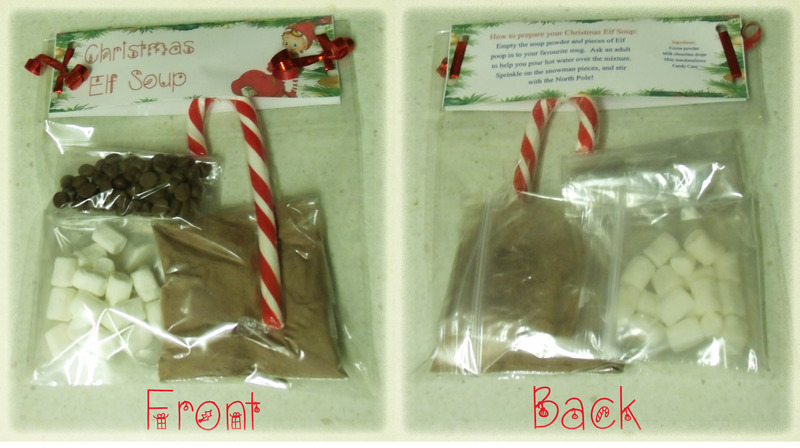 The latter on the back of the label states the ingredients (Cocoa powder, Milk chocolate drops, Mini marshmallows, Candy Cane). I managed to fit four of my labels on to an A4 sheet of card for printing. Feel free to use it, but if you are going to use it on your own site, please give credit where credit is due.